Back-handsprings Through Bridgetown: Hanging out in the 21st century. So last night a few of my people decided that it was important to spend some quality time. I completely agreed and we made plans to meet up and hang out. You may be thinking that we went to Happy Hour or met at someone’s house to watch Modern Family. 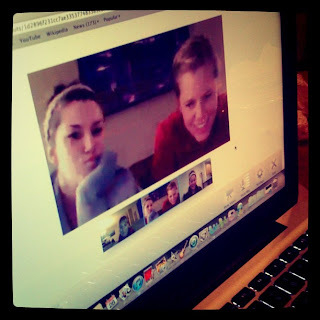 Instead we met up on Google+ for a hangout. Libby and I were on our couch, Cameron was in her living room in Seattle and Marina was in her kitchen (note: Marina lives a block away from Lib and me). We needed some quality time. The original plan was to watch Modern Family together, but after we covered the important topics we realized that it wasn't necessary. Basically we are living like Zenon: Girl of the 21st century. If you don’t know what this is, you clearly did not watch Disney Channel original movies ala the late 90s. My faves are Zenon, Brink and Johnny Tsunami. I can’t help but be reminded of Zenon as I face time with my friends or hang out on Google+. Zetus Lapetus! It is so Nebula and Zenon of us! Okay, enough crazy from me. I love that I get to see my friends when they are far away and that we can make plans to watch shows together. I will be utilizing this much more. When I need outfit approval, or if I start to feel lonely. Ahhh technology. Agreed! I feel blessed for technology! And shows like The New Girl and my friends obvi!